One year ago this month, the publishing company Seven Stories Press launched a new imprint, or division, called Triangle Square. The mission of Triangle Square is to publish books for young readers, and I’m proud that one of my books was among the very first books it released. That book was A Different Mirror for Young People, my adaptation of Ronald Takaki’s important book A Different Mirror. Professor Takaki devoted his career to exploring the history and stories of the many different races, ethnic groups, and cultures that make up America. In A Different Mirror, he wove together the stories of Native Americans, African Americans, Irish immigrants, Jewish immigrants from Russia, and many others, showing show how each group struggled to overcome the same barriers–and how each group contributed to the work in progress that is the United States. It was my great pleasure to create, from Professor Takaki’s words, a shorter, simpler version of his book so that young readers could discover the “hidden history” he presented. It is Triangle Square’s mission to combine social justice and good storytelling and share with a reading audience of young adults and children. With our Young People’s series, we have put important books about history, society, and science in the hands of young readers who will grow to shape our world. “The most challenging part of adapting texts for young readers is deciding what to take out and what to put in. Because the YA version is shorter than the parent book, I must cut some material. Cuts can range from a sentence to a whole chapter, but I have to be careful to preserve all of the key points, along with the evidence that supports them. And I also have to add new material at times, because young readers may not be equipped with the knowledge to understand a reference to, for example, “the Korean War” or “a totalitarian state.” So I slip in some brief, basic definitions or explanations. I do this both in the text itself and by adding a glossary to define important terms. The most interesting part of adapting someone else’s work is preserving that writer’s voice. I can never lose sight of the fact that this is Zinn’s book, or Takaki’s book, not mine. Nor do I want to turn it into a dry, encyclopedia-style summary of facts. I try to keep the author’s individual style intact. I use the author’s original words whenever possible, and I keep the personal stories and ways of structuring sentences that give each author’s work a distinctive tone. My goal is for my adaptation to have the same unique “flavor” as the original. With [adapting] Ron Takaki and A Different Mirror, there was an extra dimension: friendship. I first got to know Ron some years ago when I turned Stranger from a Different Shore, his history of Asians in America, into a series for young readers. I flew from Philadelphia, where I was then living, to California to meet him, and our collaboration was born. Over the years that followed I heard Ron speak to groups about his own work and the importance of ethnic studies, and I shared wonderful meals and conversations with him and his wife, Carol. Sadly, Ron passed away a few years before I wrote the YA version of A Different Mirror, but I know that he wanted very much for more of his work to become available to kids. Working on A Different Mirror was a tribute to not only an important historian but also a friend. At times I seemed to hear the echo of his gentle, distinctive voice as I read a particular line. There’s nothing like the feeling of holding your new book in your hands for the first time. All the hours you spent working on it, not to mention all the work by everyone else who helped make the book a reality, are well worth it. I got that feeling yesterday when I opened a package from our country’s ethnic and racial history. My part was to make Professor Takaki’s scholarly book shorter and easier to read, so that children and teenagers could benefit from his insights into the challenges, struggles, and also triumphs of the people and groups who came together–not always peacefully–to make up the American population. Professor Takaki was not only a famous scholar–he was also a friend. I’m proud to have helped make his work available to young people, and I know it would make him tremendously happy to see this book. Now it’s up to the readers! I’ve been working on a project near and dear to my heart: turning a magnificent history of American immigration into a book for young readers. 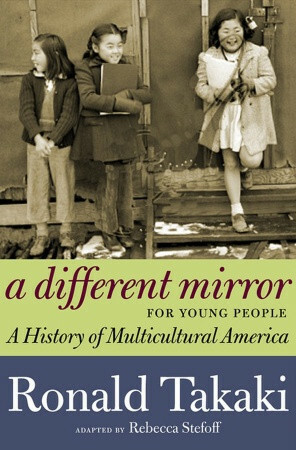 The book is called A Different Mirror: A History of Multicultural America. It was written by Ronald Takaki, who was a leading scholar of immigration history and a professor of ethnic studies at the University of California at Berkeley. The young people’s adaptation, which I have based very closely on Professor Takaki’s original text, will be called A Different Mirror for Young People. This writing project has been special for me for two reasons. First, most textbooks in U.S. history classes spend little time on the great waves of immigration that shaped this country. Textbooks often ignore the relationships among immigrant and ethnic groups, or between immigrants and native-born Americans. Professor Takaki’s book focuses on how different ethnic and racial groups of immigrants cooperated, competed, and were pitted against each other by politicians and employers. It also looks at the experiences that different immigrant groups shared–the ways the groups were similar, and also the ways in which each group was unique. Second, I not only admired and respected Professor Takaki as a scholar, I cared for him as a friend. I was lucky to get to know Ron and his wife and colleague, Carol, years ago, when I turned another one of his books into a multivolume series on Asian American history for kids. The Takakis’ warmth, generosity, and passion for learning and communicating were inspiring. We remained friends, and I was always delighted to see them when our paths crossed. Ron died in 2009. His work touched the lives of many students, teachers, and readers. I know it would please him enormously to know that A Different Mirror will soon be available to young readers.